Nebulas are huge areas of gas in space. Some form stars and some, like the Eskimo nebula are dying stars. 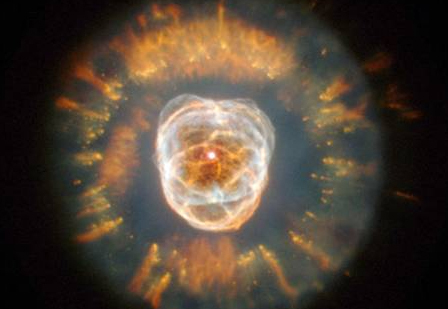 This star began dying about 10,000 years ago. 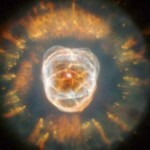 As a star dies, its outer layers expand and are flung into space by winds around 900,000 miles per hour. This cooling matter creates the bubble-looking area around the central sun. The bubbles are about one light-year long. They glow from radiation emitted by the central star. The orange-colored ring around the bubbles are comet-shaped objects whose tails are streaming away from the center.